Despite a challenging economic climate, Michigan State University (MSU) in East Lansing is thriving and continues to develop strong research programs. Currently the university is working on constructing a $40-million bioengineering facility, along with other building projects in progress that include the Bott Building for Nursing Education and Research and a state-of-the-art Plant Science Building. When completed, these buildings will add to an already strong research hub at MSU. Although much of this growth and expansion can be attributed to contributions made by private donors, MSU is also using money from its own reserve to pay for the bioengineering facility. Provost Kim Wilcox and the university regents approved plans to begin the project in the hopes that this will attract funding from external sources to improve the quality of research programs at Michigan State. According to Wilcox, the bioengineering and engineering health sciences “have significant opportunities for increased federal research funding, as well as for technology transfer for the private sector, which can promote the development of a transformational bio-based economy in Michigan.” MSU is already beginning to see the benefits of these developments. The NSF recently granted the university $4.1M in funding for the Molecular Biology Research Program. The new building will be positioned near the Clinical Center and the Life Science Building to facilitate collaborations between various departments. The building will cost an estimated $40 million dollars. Plans for the facility include create state-of-the art research space for laboratory researchers. Together these buildings will help connect the natural science, engineering and medical colleges. Michigan State University is currently competing with other major research universities to become a leader in global health. 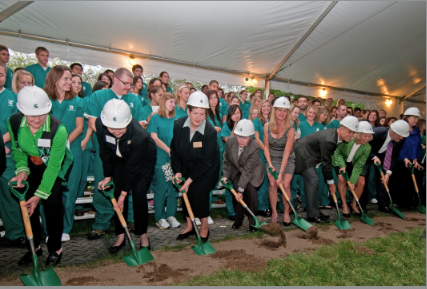 By 2012, the University hopes to attain over $100 million in funding from the National Institutes of Health. If you are a biomedical research lab supply vendor, a Michigan area life science researcher, or Michigan State University purchasing agent, you should plan to attend the Biotechnology Calendar, Inc. Front Line Event at Michigan State University on July 12, 2012. This life science laboratory product show and research networking event is an excellent way to gain a foothold on-campus.